Hate Eternal – Infernus – Season of Mist – Release: Out Now. Erik Rutan has been one of the biggest names in death metal for years and with good reason. Aside from being a famed producer for some of the greatest acts in death metal he has also had several stints with the legendary Morbid Angel and most certainly not the least; He is Hate Eternal, a band that is pretty much synonymous with high adrenaline technical brutal death metal. There have always been big gaps between each Hate Eternal album release, but the four years since “Phoenix Between the Ashes” are the biggest gap so far. Luckily Erik Rutan fully delivers with “Infernus” and despite the break between albums there is no weakness or lack aggression to be found on this new album. We also see Hrubovcak back on bass duty and there’s a new face behind the drum kit: Chason Westmoreland from the San Diego technical death metal band Burning the Masses. Westmoreland is more than up for the task as his high speed precision drums are a perfect match with Rutan’s brutal riffs. “Infernus” is mostly filled with high impact battering of drums and string abuse, but a few tracks stand out a bit more like the very dramatic title track which has some terrific doom metal-ish guitar riffing past the halfway mark, though I’d say it’s a bit of a pity that they get buried by the rhythm section. Another one that comes to mind is the instrumental track “Chaos Theory” which manages to put half an album worth of material into a nearly four minute track as well as giving it more of a grindcore-death metal vibe as well. The album ends with a very epic note with the nearly six minute epic and very aptly named “O’ Majestic Being, Hear My Call” which ends the album on an every so subtle dual lead guitar part. It speaks for Rutan’s writing skill that he can create longer songs without any hint of boredom for the listener. It’s been four years since the last album, but “Infernus” has been worth the wait. 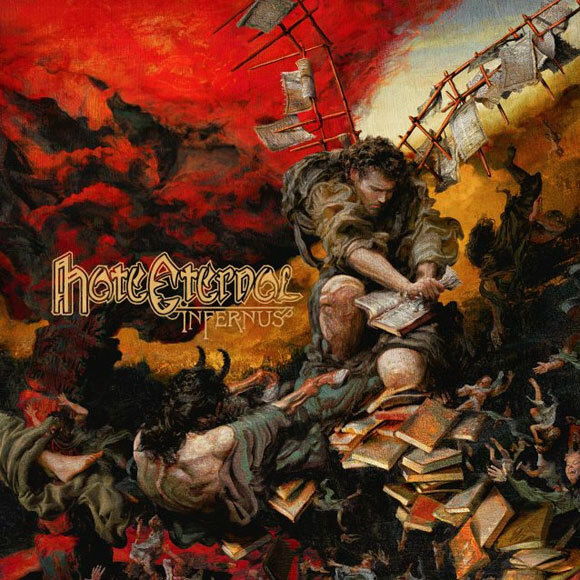 It’s Hate Eternal through and through. Let’s hope we won’t have to wait another four years for the follow-up!